I sure enjoyed getting to know Jerame and Miranda Nelson and having them at our Elijah Streams studio…in fact — they were the very first interviews in our new studio! While recording, you could really sense the presence of the Lord moving…and I know you at home watching this will too! Jerame Nelson is a gifted prophet and seer, and his passion is to teach others to move in their seer and prophetic gifts, along with miracle signs and wonders to follow. • Why you should value your hunger for spiritual gifts. • What are the 3 sets of gifts God has given you? • When and how to use the prophetic gifts and why it's important to hear His voice. • How to operate in visible signs, wonders and miracles and learn how the gift of prophecy will follow you wherever you go. I encourage you to WATCH this powerful episode from Jerame Nelson and then order his products below that we put together JUST FOR YOU — our Elijah Streams viewer. To view and order his products click here! Enjoy this episode and special products from the Nelsons on GOD TV (via DirecTV), every Tuesday at 2pm Eastern (11am Pacific). 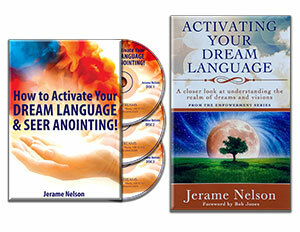 Call NOW to order Jerame Nelson's BOOK, PLUS this exclusive THREE-CD set called, "How to Activate Your Dream Language and Seer Anointing!" 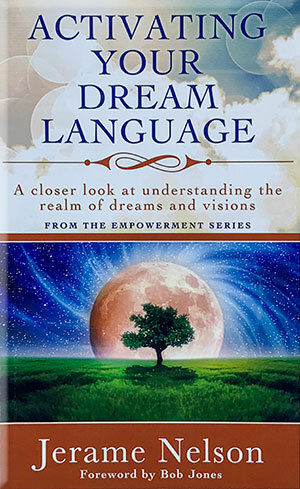 Jerame Nelson's book: "Activating Your Dream Language" and this 3-CD teaching set — that will help you to — Activate Your Spiritual Senses AND Develop your Dreams, Visions, and Revelatory Gifts. Did you know that just as there are 5 senses in the natural realm, there are also 5 supernatural senses in the spiritual realm? In this sensational package, Jeremy teaches YOU how to "demystify" the fears many people have regarding the reality of the supernatural.